Shaquille Rashaun O'Neal (born March 6, 1972 in Newark, New Jersey), or Shaq as he is popularly known, is known as one of the National Basketball Association's most dominant basketball players. O'Neal first played for the Orlando Magic, later signed with the Los Angeles Lakers, and now plays for the Miami Heat. At 7 ft 1 in (2.16 m), 325 pounds (145 kg) and U.S. shoe size 22, he is famous for his physical stature. He has several nicknames, most of which he conferred upon himself, such as "the Diesel", "the Big Aristotle", and "Superman." O'Neal was named "Shaquille Rashaun" ("Little Warrior" in Arabic) by his biological father, Joseph Toney. However, he is not close to his biological father; one of his songs, "Biological Didn't Bother", explains his feelings. His mother, Lucille O'Neal Harrison, would marry U.S. Army sergeant Phillip Harrison shortly after Shaquille's birth. Shaq spent some of his childhood in Germany in Wildflecken, Bavaria, where his step-father Harrison was stationed with the U.S. Army. It was there that he learned to play basketball. O'Neal fractured both of his wrists while climbing between two trees, trying to imitate Spider-Man, his comic strip favorite, and sometimes explains that this is why he makes less than half of his free throws. He first gained national attention as a star at Robert G. Cole Junior-Senior High School in San Antonio, Texas. He became High School Player of the Year during his playing years there. As a young man, he attended Louisiana State University to study and graduate as a bachelor in law. While on LSU's basketball team, he was a two-time first team All-American, two-time Southeastern Conference player of the year, and the national player of the year in 1991. Dale Brown, LSU's coach at that time, states that he first met Shaq while he was visiting Germany, and mistook the then-13 year old for one of the soldiers. He was the first player selected overall in the 1992 NBA Draft by the Orlando Magic and helped the team to a commendable 41 wins that year, missing the playoffs by one game. He further raised his fame that year with two infamous dunks which broke the supports holding the basket and backboard, both on national television: the first coming against the Phoenix Suns, the second against the New Jersey Nets. In the 1993-94 season, Shaq helped the Magic to their first playoff berth ever. In 1994-1995, O'Neal and Anfernee (Penny) Hardaway helped their team reach the NBA Finals, but were swept in four games by the Houston Rockets. After the 1995-1996 season, O'Neal left Orlando to join the Los Angeles Lakers for an unprecedented seven year $120 million contract. He and teammate Kobe Bryant created one of the most effective guard-center combinations in NBA history, although their relationship was a tenous one and the two feuded with each other frequently in public and private. Regardless, the two (coached by Phil Jackson) enjoyed tremendous success on the court, as O'Neal and Bryant led the Los Angeles to three consecutive NBA titles (2000, 2001, 2002). Shaq was named MVP of the NBA Finals all three times and has the highest scoring average for a center in Finals history. He was also voted the 1999-2000 regular season Most Valuable Player, almost becoming the first unanimous MVP in NBA history. At the beginning of the 2003-04 season, O'Neal announced he sought an extension to his contract. Laker management, however, was hesitant to meet his demands. The Lakers offered Shaquille O'Neal a contract in February 2004 (according to the book: Madmen's Ball by Mark Heisler) to remain the highest-paid player in the league but O'Neal refused. After the Lakers were defeated by the Detroit Pistons in the NBA Finals, O'Neal was angered by comments made by Lakers general manager Mitch Kupchak regarding his future with the club, and promptly demanded a trade. O'Neal was traded to the Miami Heat for Lamar Odom, Brian Grant, and Caron Butler. On July 14, 2004, Shaq was officially traded to the Miami Heat for Caron Butler, Lamar Odom, Brian Grant and a first-round draft pick. The trade was immediately considered one of the most important in sports history, with analysts uncertain that one man could replace so many of Miami's key players. However, Shaq's new-look Heat surpassed all expectations, easily claiming the best record in the Eastern Conference. Those he was traded for failed to even lead the Lakers to the playoffs. Many pundits compared the Lakers trade of Shaq to the Boston Red Sox trade of Babe Ruth, referring to their dismal following season as "The Curse of the Shaq-bino". He narrowly lost the 2004-2005 MVP award to Phoenix Suns guard Steve Nash in one of the closest votes in history. Despite being hobbled by a deep thigh bruise, Shaq lead the Heat to the Eastern Conference Finals and a Game 7 against the defending champion Detroit Pistons and lost only narrowly. In August 2005, O'Neal signed an 5-year-extension with the Heat for 100 million dollars. Whereas critics denounced this extension as overpaying an aging player, supporters laud the Heat staff for landing the probably most dominant player in the NBA for "only" $20 million a year, in a period where mediocre or constantly injured players like Keith Van Horn, Jalen Rose, Derek Anderson, Allan Houston or Brian Grant earn almost the same amount. By signing this contract, O'Neal contradicted his earlier comment of him never taking a pay cut in the interests of the team. He would have received $30 million this season but took a pay cut of $10 million a year to help the HEAT make trades for better players. -O'Neal has been selected to the All-Star Game every year since his rookie season in 1993 (except for the 1999 lockout season, in which the game was not held). -He has received All-NBA-Defensive honors in 2000, 2001 and 2003, though he has never been a first-team selection. -O'Neal was a key member of the 1994 World Championship and 1996 Olympic basketball team, which won gold. -He has been selected by the NBA as one of the "50 Greatest Basketballers" in 1996. He was the youngest member of this list. -In 2005, O'Neal became the first player in NBA history to average over 20 points and 10 rebounds per game for 13 seasons. -O'Neal has earned All-NBA-Team honors in 11 of his 13 seasons. -He also was awarded the MVP in the 1999-00 season and in the 2003-04 All-Star game. -O'Neal has a business law degree from LSU. At LSU there is a lodge called the "Shaquille O'Neal Lodge," which is part of the Cook Conference Center. -On June 25, 2005 O'Neal earned his MBA from the University of Phoenix. -O'Neal was ranked #9 in SLAM Magazine's Top 75 NBA Players of all time in 2003. O'Neal is a physically exceptional player. His 7'1"/320-lb frame gives him enormous power, and for a man of that size, he is quick and very explosive. His "drop step," in which he posts up a defender, turns around and powers past him for a slam dunk, has proven virtually unstoppable. In addition, he is a talented and stylish passer, and an effective defender. His dominating physical presence inside the paint has caused dramatic changes in many teams' offensive and defensive strategies that can be seen over the course of his career. His other weakness is his weight. O'Neal usually shows up to training camp overweight. During his last few years with the Lakers he weighed around 350-lbs. When O'Neal was overweight he was prone to many injuries, especially on his big right toe. 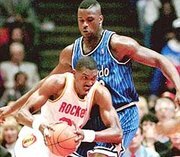 Many feel that Shaq's star power in the NBA causes referees to turn a blind eye to some of his minor rule infractions. Many claim that his awkward shooting stance and general forward motion cause him to violate Rule 10, Section I-d, a rarely-enforced rule stating that the shooter cannot cross the plane of the free throw line until the ball has touched the basket ring or backboard. On the other hand, O'Neal's defenders claim that because of his enormous size, officials allow him to take more physical abuse than other players. For several years, O'Neal has suffered from arthritis in his right big toe, due to more than a decade of running, jumping and dunking with his 320-lb. frame. Shaq is generally liked by the media for his playful tone in interviews and generally eloquent manner in comparison to other athletes. He has been called "the Big Aristotle", a name that was self-given, for his composure and insights during these interviews. Shaq's humorous and sometimes incendiary comments fueled the LA Lakers long standing rivalry with the Sacramento Kings; Shaq frequently referred to the Sacramento team as the "Queens". Shaq also received some media flak for mocking the Chinese language when interviewed about newcomer center Yao Ming, but he was able to downplay the media attention to the event. During the 2005 NBA playoffs, Shaq lamented of his poor play due to injury as being comparable to Erick Dampier, a Dallas Mavericks center that had failed to score a single point in one of their recent games. The quip was not responded to malevolently, but inspired countless citations and references by announcers during those playoffs. He is very vocal with the media, and often jabs at his former Laker teammate, Kobe Bryant. In the summer of 2005, when asked about Kobe, he responded, "I'm sorry, who?" and went on about not being familiar with that name. Shaq was once a spokesperson for Radio Shack. In one of its commercials, he snapped his fingers and changed the spelling to "Radio Shaq". Shaq appeared on season 5 finale of Punk'd after being tricked by Ashton Kutcher while chasing a man who tried to destroy his SUV. O'Neal married his long-time girlfriend, Shaunie Nelson, on December 26, 2002; they have 3 children: Shareef Rashaun, Amirah Sanaa, and Shaquir Rashaun. He also has a daughter, Taahirah, by ex-girlfriend Arnetta Yardbourgh. Off court, Shaq has maintained a high level of interest in the workings of the police department, and has become personally involved in law enforcement. O'Neal went through the police academy in Los Angeles, and became a reserve officer with the L.A. Port Police. Since moving to Miami, he has begun training to become a reserve officer for the Miami Beach police, and will soon be certified to make arrests and carry a .40-caliber pistol. In March 2005 he was was given an honorary U.S. Deputy Marshal title and named the spokesman for the Safe Surfin' foundation; he will serve an honorary role on the task force of the same name, which tracks down sexual predators who target children on the Internet.